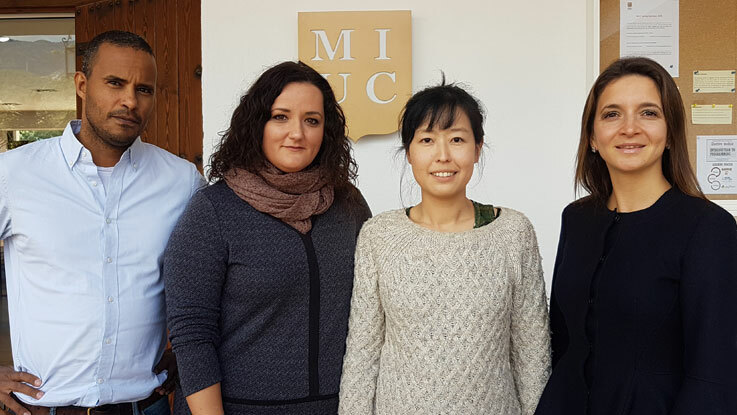 MIUC´s expert team comprising Dr. Maria Blanco-Palencia, Dr. Ming-Jin Jiang, Dr. Beata Froehlich, and Christian Olsen hosted a Career Day at Sunnyview School on the Costa del Sol. They were accompanied by our expert photographer, Milan Trninic. Sunny View School is the leading British school on the Costa del Sol and was established over 40 years ago, welcoming students of all nationalities. Their study programmes are based on the English national curriculum and taught by a team of qualified, experienced and inspiring UK-trained teaching staff. Sunnyview´s students are encouraged to develop habits of curiosity, initiative, rigour and independence of thought, which makes them the ideal candidates to fit MIUC´s stringent academic standards. The MIUC professors addressed two groups; the first being a group of 25 eager young students in Year 11 (last year of GCSEs) and the other a group Year 12 (First year of A levels) students. The first session is entitled The Career Success Triangle: Economics, International Relations and Law opened at 14:20. Key notes presented to the students included the topic of studying International Law/International Business Law in MIUC as a course for anyone seeking a competitive advantage in today’s international job market, and in which our students gain a plethora of crucial transferrable skills. We focus on the interconnectedness of the various disciplines, teaching our students how to relate business theory to recent world events and debate the implications thereof, including compelling real-life examples of contract law and demonstrating how contracts are applied across various jurisdictions. Economics, whose subject, at the most fundamental level, is not money or the economy but the implications of rational choice, is an essential tool for figuring out the effects of legal rules. Knowing what effects rules will have is central both to understanding the rules we have and to deciding what rules we should have. The fundamental assumption of the economic approach, to law and everything else, is that people are rational. A mugger is a mugger for the same reason I am an economist: Given his tastes, opportunities and abilities, it is the most attractive profession open to him. What laws are passed and how they are interpreted and enforced, ultimately depend on what behaviour is in the rational interest of legislators, judges and police. International Relations is a multidisciplinary combination of politics, history sociology, economics and law and focusses on issues human rights, conflict resolution and international law, governance, in both the public and private domains. Different career opportunities include, in the public sector foreign service, diplomacy, civil service, work or careers with international organisations, such as the United Nations, The International Monetary Fund, and the World Bank. In the private sector, careers could include political consultancy, international banking and finance and employment opportunities with non-profit- and non-governmental organizations. The second session is entitled Developing your Career in Marketing and the presentation commenced at 15:10 and was presented by Christian Olsen, who discussed design, and his work within this domain and its close relationship with marketing. He discussed how design is akin to learning another language – in this case a visual language – in fact, everything we touch and see will at some point have had a designer involved in the process. The students were asked to try to analyze the meaning of the Apple logo to demonstrate how designs that work usually have an amazing story behind them. The MIUC professor stressed that the future of design looks very promising, due to the very visual nature of our society in terms of mobile phones/ iPads / computer games / VR and the list will probably grow with upcoming technology. Our team concluded their presentation by highlighting the fact that MIUC graduates sally forth with the firm ability to think critically and are fully prepared to face the competitive job market, as MIUC takes great pride in equipping our students with the necessary skills and knowledge to be ready for all the changes awaiting them.